Play Free Core Gaming online fruit and neon themed slot Jackpotz with 3 reels each with 3 symbols on them and 5 fixed paylines. There are 11 traditional symbols, a Wild and a Mega Streak that launches a round of winning free spins. If you are playing for real money there are 7 Progressive Jackpots that can be won. As well as the Wild symbol and progressive Jackpot, that are available in this online slot game by Core Gaming, there is also a Mega Streak Bonus round. When the Mega Streak symbol lands on the centre winline of the 3rd reel, the Mega Streak bonus will be activated. This bonus round will award a random number of spins, between 4 and 20, and every spin will result in a win, using the current Total Stake amount. If the Mega Streak symbol lands again, it will not add any additional spins to the round. The 7 Pots of money that are awarded when you play the Jackpotz Bonus can only be won when playing with Real Money. Throughout the game, the letters in the word Jackpotz will randomly light up and once all eight letters are highlighted the Jackpotz Bonus will trigger. The 7 coloured Pot metres, located at the bottom of the reels, fill up to indicate the length of time since each Pot was last triggered and display the amount that will be won. 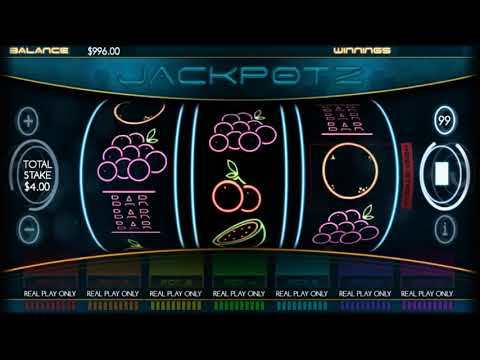 During the Jackpotz bonus round the symbols on the reels disappear and are replaced with the 7 coloured Pot symbols. The reels will start spinning and whichever coloured Pot lands on the centre winline is the prize that will be awarded. If the result of the spin is non-winning, a random consolation prize may be awarded. The higher the stake the better the chance of the player winning a jackpot. If 3 identical symbols appear next to each other, starting with the leftmost reel, along one of the 5 paylines then they will form a winning combination. The payouts for them can be found in the paytable and change according to your total bet amount. Above the reels you will see your Balance amount and the amount of the most recent winnings. At the very top of the screen is a black bar which also shows your balance, stake amount and latest win amount. There is also a ? which opens a new pages with the detailed game rules and a speaker which will turn the game sounds on or off. If you have enjoyed playing this game, there are plenty of other online slots you can try at NeonSlots.com.